"Iran must not have nuclear weapon capability," he told Kerry. "I think no deal is better than a bad deal." For Netanyahu, any deal with Iran must include a prohibition on centrifuges that can be used to enrich uranium to a weapons grade level, as well as the dismantling of a plutonium heavy water plant in Arak that has yet to come on line. "They should get rid of the amassed fissile material, and they shouldn't have underground nuclear facilities," Netanyahu said in reference to the Fordow facility near the city of Qom, which was discovered in 2009. Netanyahu is not alone in his plea for the Obama administration to take a slow and cautious approach in the latest round of negotiations. Members from both parties in Congress have urged the administration not to loosen any of the sanctions that are choking Iran's economy prematurely. Legislation is being drafted that could tighten the sanctions regime until a deal is reached. 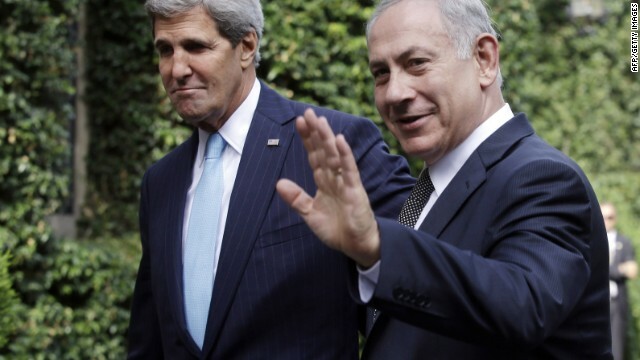 "No deal is better than a bad deal," Kerry said echoing Netanyahu as the two began approximately seven hours of talks about Iran, Syria, and the peace process with the Palestinians. "But if this can be solved satisfactorily, diplomatically, it is clearly better for everyone." The next round of talks with Iran and the P5+1 is scheduled to take place next month in Geneva. 2. Assad knowing the entire world is angry, angry enough our strike would have gone largely unnoticed. 3. Russia encouraging them , effectively we are working with russia as partners. 4. Assad knowing those weapons posed as much of a threat to him as to the rebels . This is Iran who has chanted death to america for 20 years, who has repeatedly stated any talks will exclude stopping them from enriching, who has promised to wipe israel off the planet like a cancer . The bottom line? Iran holds no klout. Iran has no leverage. Iran has no integrity . No one in iran is losing sleep over the consequences of their actions as many were on both sides in syria. We should absolutely not be taking this seriously until serious concessions are made. Talk. Means. Nothing. Especially with Iran/NK. Israel knows what they are doing. They will act when necessary. Israel is America's real enemy. Many countries have nuclear weapons, including the US. Iran however, CANNOT be allowed to poses nukes because they are fanatical, homicidal, terrorist sponsoring regime. And most importantly, unlike the Soviet Union, they are NOT afraid of their own death, including the deaths of their children, whom they sent to clear Saddam's minefields during Iran-Iraq war. Israel has invaded its neighbors countless times since its creation. Logic would dictate that Israel, with its nuclear weapons, is the real threat to world peace, not Iran. FREE PALESTINE! Out of seven hours, how long did they "discuss" Palestine? My guess, about seven minutes! I see no reason the two should discuss Palestine at all without Palestinian representatives. Unlike Iran, there is a clear path to the resolution of the Palestinian problem and it is a NEGOTIATED PEACE AGREEMENT. As long as the Palestinians are unable or unwilling to participate in this process there will be no negotiations, no agreement, and no peace. You mean discuss "palestine" ? Netanyahu – Iran "shouldnt have underground nuclear facilities" Why not? So even after the world has been satisified that there is no weapons program Israel still doesnt want underground faciltiies in Iran, I wonder why...Perhaps to bomb a nation following its obligations while they themselves keep running their weapons program in Israel. Or maybe to send another virus to cause some massive dmage and cuse a leak to hurt the people of Iran. they build them underground because of war mongrels like Netanyahu. Israel is the LAST country to talk about follwing UN mandates and resolutions. Just like the US taking unilateral action and attacking another country? Much of a double standard going on in your life? The US wanted Iraq to dismantle a weapons program that saddam wasn't denying he had. Israel doesnt want Iran to even have a peaceful nuclear program, why do they care if a peaceful program is underground? It offers protection from terrost strikes or military attacks that would be catastrophic if a nuclear plant is hit. The only double standard here is that towards Israel by people like ou. Are you saying it is ok to attack a nation unilaterlly because they have a hidden weapons program that is illegal, while at the same time you're ok with Israel's nuclear weapons program. And who said I agree with the US unilaterlly attacking nations, at least the Iraq invasion. Did I direct the US to do so? So where is my double standard. Ape. Sawyer... If you REALLY believe that Iranian nuclear program is PEACEFUL and that Iran has no intentions to obtain nuclear weapons you should have no troubles to explain how exactly Iranian leaders will possibly USE hundreds of those long- and intermediate range ballistic missiles they've obtained during the last several years. Please consider that these missiles are virtually harmless without proper warheads, that they cost at least $3 million each and that I've asked this question here for many months but still did not get any answers. I agree. Israel should be investigated by the UN and there should be sanctions imposed until it dismantles it's weapons of mass destruction. OK, Blasphemer, tel the truth. You really love the monstrous regime in Tehran, don't you? You really oppose ANY restraint on their being able to make-good their stated desire to "Wipe the Zionists off the map". Isn't that so? I hope to God your kind don't reproduce. "aware it will be vital for Iran to live up to those standards other nations that have nuclear programs live up to as they prove those programs are indeed peaceful." Oh really? There are standards? You mean the ones that Israel does not live by? Israel has a nuclear program, and they haven't been inspected. Their nuclear weaposn program hasn't been dismantled. How original.....It's obvious your repeated comment posted over and over ad nausium is all you know about the ever changing political situation in the Middle East. Doesn't change the facts listed in the post! The US has acted as stated. Period! kerry gettin his marching orders from the feces called nuttinyahoo..israel has ruined the U.S.
Did you disagree with something Netanyahu said, "joe d"? If so WHAT WAS IT? Hint: To DISAGREE means that you can PROVE that the statement in question was FALSE. Disagreement means you have to prove something is false? Ohhhhh I get it, your name is a joke you're not REALLY a thinker! Haha that is hilarious! Good for you, you almost had us fooled. Sawyer... If you "DISAGREE" with something but do not even try to prove that it is wrong it means that (at least to your best knowledge) whatever you "disagree" with is CORRECT. Well, that was full of insight.